If you&apos;re more comfortable interacting with database systems through a graphical interface then you can accomplish the most common database tasks with OrientDB Studio, the web interface. 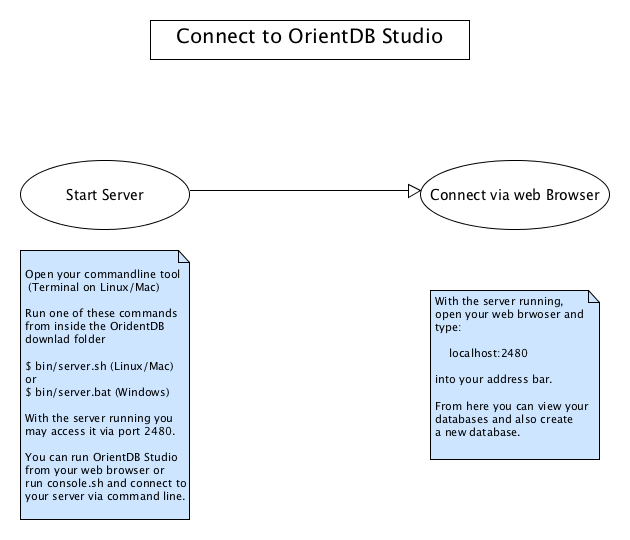 By default, there are no additional steps that you need to take to start OrientDB Studio. When you launch the Server, whether through the start-up script server.sh or as a system daemon, the Studio web interface opens automatically with it. From here you can create a new database, connect to or drop an existing database, import a public database and navigate to the Server management interface. For more information on the OrientDB Studio, see Studio.